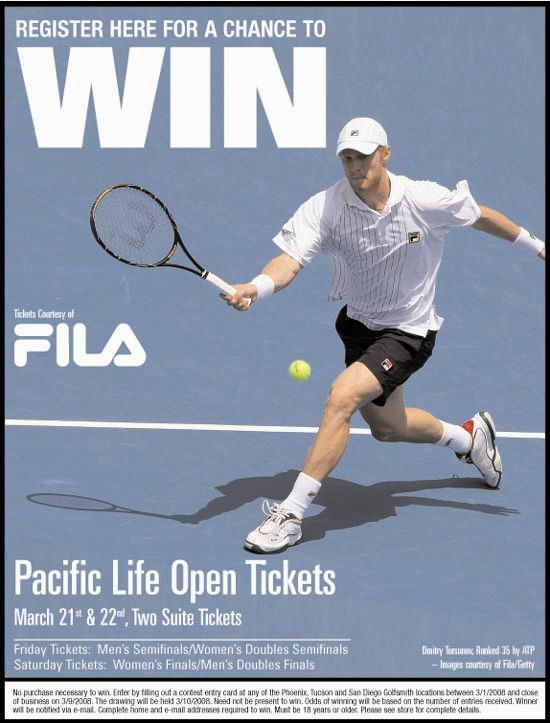 Golfsmith Golf & Tennis is giving away 2 box seats on 2 consecutive days during the Pacific Life Open as provided by FILA. One winner will be drawn from registrants at any Golfsmith Golf & Tennis store in Arizona and San Diego. The winner will be notified on Monday, March 10th. Could be a fun weekend and great way to see some fantastic tennis at the Pac Life Open for some lucky person! Stop by a Golfsmith Golf & Tennis store near you (AZ/San Diego) and register to win today!